Explore the most emblematic sites in the City on board of comfortable sightseeing buses with retractable roof. Hop-on and hop-off from the bus as many times you wish thru any of our routes. Discover the most exiting museums, restaurants and entertainment centers in the during your day tour. Sightseeing tour and panoramic view of el Zocalo, the Metropolitan Cathedral, Independence Angel, Antropologia Museum, Polanco, Zona Rosa, and Roma neighborhoods, all along one route. 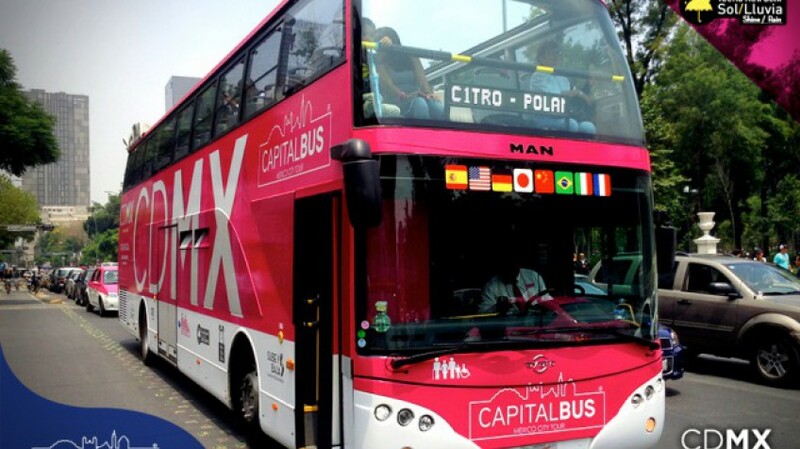 Visit the hippest commercial and business areas in Mexico City. Travel from the Angel of Independence all across the City to Santa Fe and get to know one of the largest malls in Latin America with its exclusive and trend shops, ice skating, restaurants and entertainment centers for all tastes and ages. Visit Garibaldi Plaza to listen some Mariachi Music the Tequila and Mezcal Museum. Get to visit the Guadalupe Virgin Temple (Basilica), San Judas Tadeo Church and the main temples around downtown.